The Edge brings new colour range every now and then, and our edgeband collections are precisely matched to top HPL suppliers. 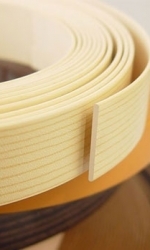 Due to the edgeband outstanding materials characteristics, usage of the edgeband in furniture industry is increasingly becoming well known and has been very successful. When it comes to furniture design, choosing the right material is critical, as what you choose will not only impact the quality and cost, but also the environment. Give your projects the perfect edge with The Edge edging and quality edgebanding services. Discover a variety of designs, including a selection of over 300+ decors with eye-catching realistic textures. Sunyu also provides custom-made edging at a minimum quality.